The Joker, ‘…a tonic for himself’, poses confidently as the Hectoring Hoodlum himself. 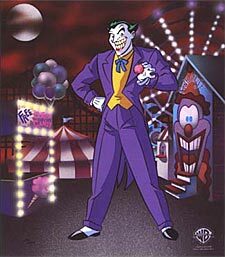 Against the background of his Carnival of the Comedic Conundrum, this is a hand-painted limited edition cel in the Classic Series from Warner Bros. inspired by scenes from ‘Batman: The Animated Series’. The Joker first appeared in Batman #1 (Spring, 1940). His list of evil spans common thievery all the way to large-scale evil. Rumor is The Joker became his identity after falling into a vat of chemical waste, which permanently altered his appearance into looking “clownish.” He takes more of an interest in taunting Batman, than actually escaping the Caped Crusader and Justice. To The Joker, his duel with Batman is only a game. Currently, The Joker and Harley are an item again, and hold exclusivity as two individuals Batman would enjoy putting back inside Arkham Asylum.